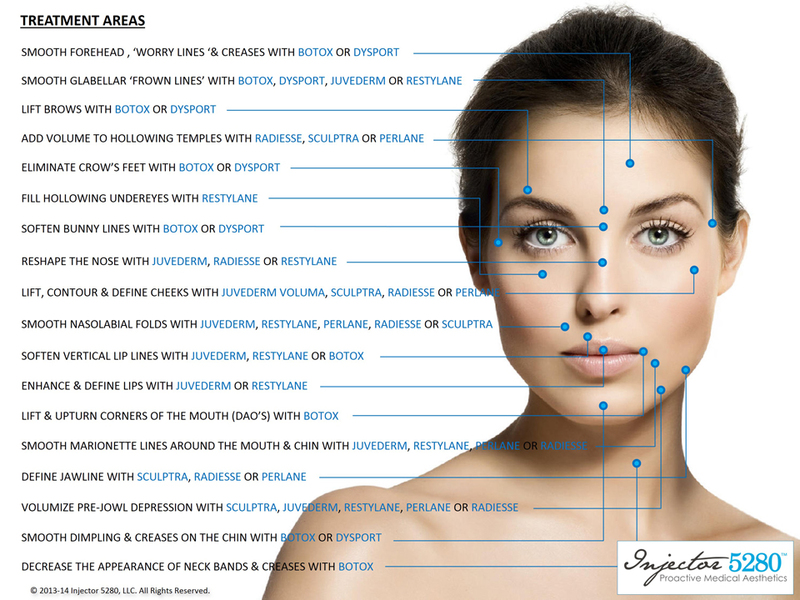 See our facial diagram for Botox and dermal filler injection sites and treatment options, available at Injector 5280 in Denver, Colorado. Using one or a combination of the above injectables, our highly skilled and extensively trained Aesthetic Injectors will work with you to to help you achieve your aesthetic goals. We look forward to welcoming you to Injector 5280. We know you will feel assured that you have chosen a practice committed to the highest standards of patient satisfaction and attention to detail. Injector 5280 is a medical aesthetic practice in Denver, Colorado. Injector 5280 specializes in Emsculpt, CoolSculpting, Hair Restoration and aesthetic injectables, including Botox and dermal fillers, such as Juvederm, Voluma, Restylane and Sculptra, as well as chemical peels. Kellie and April are amazing! Their customer service is incredible. They really know what they are doing and make recommendations that are custom to you and your body. Rather than make suggestions that could ultimately earn them more money, they make recommendations in your best interest. I have been so pleased with my results and will continue to go back to them! I would highly recommend going to Injector 5280. They know what they’re doing. I felt very comfortable as my Botox virginity was being taken. Was also told because it was my first time I wasn’t going to get a whole lot, however if I did want more I could come back in 12 days. It’s been 11 days and I honestly didn’t think I would be so content with the outcome. Very easy and painless experience! I’ll definitely be going back regularly! April is amazing. Highly recommend her. She made made me and finance feel right at home (hard to believe while having a needle injected into your face) but she did. Thanks April, we'll be back to see you whenever needed! I had a terrific experience while working with the staff at Injector 5280. Kellie and April are world class and ensure that they fully understand all goals that you have in order to best meet your needs. I am so very thankful for the support and words of encouragement during my time there and with checking in on me afterwards. I would strongly recommend their services to anyone looking for treatment in a facility that is not only equipped with the latest and greatest, but also seen by staff that are top notch in their expertise, friendliness and honesty! April and Kelli at Injector 5280 are incredible! I would happily give Injector 5280 a one hundred star rating if I could. As a current Nursing student, I am incredibly picky and cautious. Both Kelli and April have many years of experience as well as high-level degrees and certifications in their field. The ladies at Injector 5280 offer a clean, professional and welcoming atmosphere. I always feel like I am walking into a spa surrounded by friends when visiting their office. I highly recommend 5280 Injector. Sarah is amazing! She made me feel comfortable, kept checking to make sure I was ok, and did an amazing job! I am so happy with how my lips turned out. I highly recommend going to her! Worth. Every. Penny.Fantastic People - Professional Results. Every experience I've had here has exceeded my expectations. The entire staff is phenomenal - Kellie is truly an artist, and Sara is like a magician, except that my results are no illusion!! One of the things that really impressed me was how the staff was really invested in helping me rather than up-selling me to make more money.I am so pleased I made the decision to come here and I feel like I've received a great value for money spent. Simply put, I believe Injector 5280 is among the best of the best in Denver. Sarah is amazing at what she does and very well educated. Sarah always makes sure that I understand what she is doing before she begins anything. Glad I ventured off and found this place and the amazing staff. I am glad and happy to highly recommend this to everyone that wants professional aesthetic work done. My face has never looked so beautiful! Thank you Sarah for everything you have a life long patient! I was extremely happy with April and my appointment. I’m a huge baby and she was so mice, very slow and talked me through it all, even though it wasn’t my first time. She was very sweet and caring. I’ll definitely be going back again! I recently received my second PRFM treatment at Injector 5280 and I'm so happy with it! I can already see very encouraging results in the thickness of my hair. I just wish I had started the treatment sooner! The nurse who provided the treatment, Sarah, Kellie and all the staff were extremely knowledgeable and professional and were so nice through the whole process. Easy booking and parking, well appointed office. I met with Sarah for a first time consult and she was honest, did not try to oversell me, informative and very reassuring. I am the type of person who prefers to know if there is any discomfort. She told me it would be uncomfortable as the face is sensitive. I was prepared for the worst and it was nowhere near that so a very pleasant surprise. She did everything possible to minimize the discomfort. Over all a great experience and I will be back with the results review. I have to mention the front desk...I got a wonderful welcome as I entered the establishment...great vibe and very friendly. Love!! I came in for a consultation hoping to get Coolsculpting but after really going over the pros and cons with them they thought Emsculpting would be a better fit. I just completed my sessions and am absolutely thrilled with the results! This place is awesome! I’m truly thrilled.